This is a 137cm long Anaconda Snake plush stuffed toy by Wild Republic. 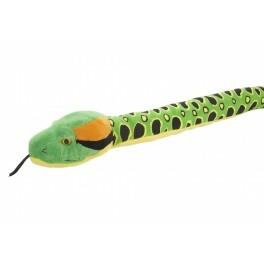 This Anaconda Snake has beautiful markings, is green yellow and black in colour and has gorgeous eyes. This Anaconda comes from the Snakess range by WildRepublic. This is a 30cm plush stuffed toy giant squid. This is a 14cm Plush Stuffed Sloth by Keel Toys. This plush toy Sloth measures 30 cm (12 in) in size.